I've been using CD Manipulator from my USB drive ever since I started to have problems with the burning software that came bundled with my laptop. Works great, and it's the only free program I've found so far that does direct CD copies! It doesn't seem to add anything to the registry, but I'm not as well versed in checking as you guys I'm sure. Sorry, should have mentioned that although it is Japanese in origin, the first time you run it you have a choice of languages, one of which is English. Last edited by webfork on Wed Mar 28, 2012 6:36 pm, edited 1 time in total. Does list Microsoft Windows 7 / Vista / XP and Windows Server 2008 / 2003 compatibility and is open source (BSD). Would definitely like to switch the entry if it does turn out portable. New version is easier to extract and run. Is it OK to post my Mod of this? What changes did you make compared to the Rizone version? And do you have a download link too? guinness wrote: What changes did you make compared to the Rizone version? And do you have a download link too? Old topic update: currently, OP link for CD Manipulator is still alive; nonetheless, RizoneSoft has taken its own CD Manipulator-Mod and re-hashed into a new soft, now called Carbon CD (http://www.portablefreeware.com/?id=1062). I didn't test it, but was rather favorably impressed with the previous iterations, which were natively portable. [url]http://www.rizonesoft.com/software/carbon-cd/[/url] author wrote: Use Carbon CD to make backup copies of your music or data CDs. Copy (Clone) most CDs in just a few mouse clicks. Create perfect 1:1 copies or save your CDs to your computer. If you are familiar with Clone CD, you should feel right at home using Carbon CD. The biggest difference between the two is that Carbon CD does not support DVDs yet (Still working on it). Carbon CD is based on the CD Manipulator code created by Y. Kanechika. 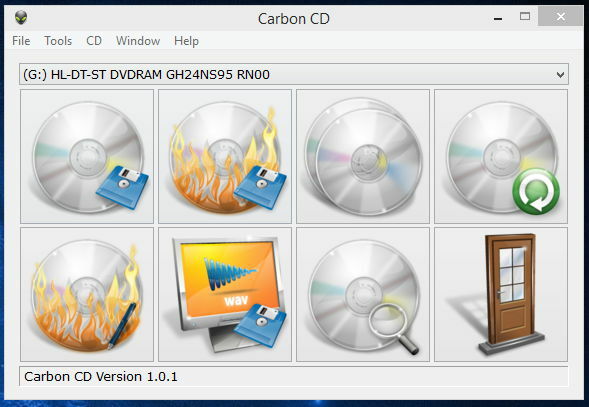 Download Carbon CD latest release (v1.0.2) from http://www.rizonesoft.com/software/carbon-cd/. @webfork: as the present is Carbon CD official forum topic, please amend OP. Thanks.